"If new, powerful antibiotic drugs are not discovered, we ‘may’ return to the pre-antibiotic era." Mathew Upton from the University of Plymouth thinks that the solution may lie deep under the surface of the ocean, in dark, cold environments where weird and wonderful sponges live. Mathew is a Professor in Medical Microbiology at the University of Plymouth and the lead for the Antibiotic Resistant Pathogens Research Group. Antibiotic resistant infections are one of the leading threats to human health and modern medicine. The WHO and international governments have stated that urgent measures are needed to avert the crisis we face. In our group, we have a programme of drug discovery to help meet the need for new antibiotics. Our lead antimicrobial, epidermicin, has unique activity in a relevant infection model and is in pre-clinical testing. These antibiotics are of a new class (bacteriocins), have novel mechanisms of action and have excellent potential for development into the next generation of powerful antibiotics to treat and prevent drug resistant infections. 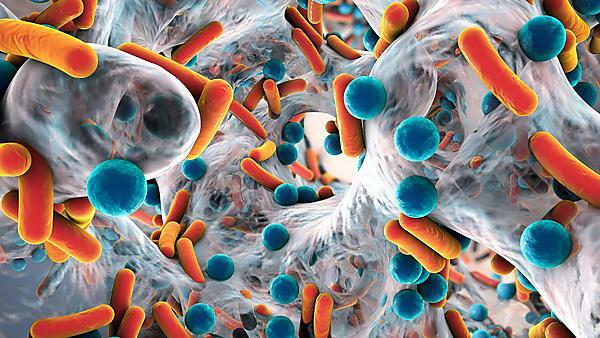 By 2050 it is estimated that 10 million people world-wide will die as a result of being infected with drug- resistant bacteria (Lord Jim O’Neil, 2014). Bacteria which were previously susceptible to antibiotic treatment have evolved to develop resistance to commonly used antibiotics, rendering them ineffective to combat infection. Now there are fewer antibiotics available to treat patients with certain infections. Hence, there is a global drive not only to discover new antibiotics to combat these bacteria, but also to develop new types of diagnostics that can help diagnose infection at point of care. Research focuses on designing low cost, rapid (5 minutes! ), point of care nucleic acid-based biosensor assays for detection of AMR resistance genes and other pathogens that work within minutes from sample to result. This research is multidisciplinary and encompasses the Engineering, Biology, Informatics and Chemistry disciplines. The University’s public engagement work to raise awareness of the issue of antimicrobial resistance (AMR) was recently shortlisted in the 2018 Antibiotic Guardian Awards, on behalf of Public Health England, in the Public Engagement category. The AMR team, comprising academic and professional services staff, post-doctoral researchers, PhD candidates and undergraduate project students, has held a range of events over the past year – and continues to do so – to highlight the issues surrounding antibiotic resistance and the need to preserve their efficacy for future generations. Destroy deadly bacteria and keep humanity's precious antibiotics working for as long as you can in this free, fast-paced, and addictive action game. The story of this casual, real-time puzzle game comes straight from today's headlines: the rise of superbugs, resistant bacteria which can't be killed by the drugs we rely on to fight infection. "The new Superbugs game looks great – and as well as being fun, it will help you find out about the huge problem of drug-resistant bacteria – a threat to all our health." Professor Alice Roberts. The issues of the unsustainable use of antibiotics has rumbled along in the background for many years with academic report after academic report highlighting that overuse and misuse is causing ‘super-bug’ bacteria to develop which is treatment resistant. Read Dr Victoria Hurth's blog on balancing the short and long term, international cooperation and intergenerational justice when it comes to sustainability and the use of antibiotics. Key messages on antibiotic use are available on the UK government website. There is guidance on how to use antibiotics responsibly for patients, animal keepers and pet owners, and prescribers. Pledge now to become an Antibiotic Guardian! Test and improve your knowledge with these quizzes and crossword puzzles on antibiotic resistance.